Annapolis, MD; January 7, 2019—The Entomological Society of America seeks candidates to serve in the position of editor-in-chief of Thomas Say Publications. The current Thomas Say editor-in-chief, James B. Woolley, Ph.D., will step down at the end of 2019 after a distinguished term of service. Thomas Say Publications is a peer-reviewed line of books that publishes Monographs, Proceedings, and Memoirs. 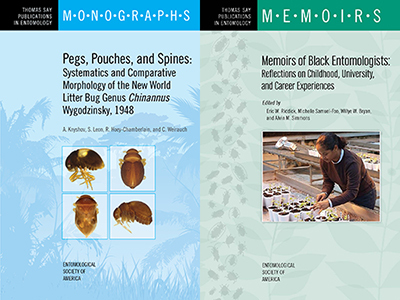 Recent Thomas Say Publications include The Cicadas (Hemiptera: Cicadoidea: Cicadidae) of North America North of Mexico, Second Edition; Pegs, Pouches, and Spines: Systematics and Comparative Morphology of the New World Litter Bug Genus Chinannus Wygodzinsky, 1948; and Memoirs of Black Entomologists: Reflections on Childhood, University, and Career Experiences. The ideal candidate should be a respected and recognized scientist whose reputation brings prestige and visibility to Thomas Say Publications. He or she should have significant experience in the writing, editing, and reviewing of scientific manuscripts. He or she should also be well grounded in taxonomy and systematics, with a solid understanding of the rules of taxonomic nomenclature. The selected candidate will ensure that Thomas Say Publications continues to publish only the highest quality works on systematics and other topics and will have a leading role in ensuring that ESA's publications program continues to thrive. The Thomas Say Editorial Board will review all applications and forward a recommendation to the ESA Governing Board for approval. The selected candidate would begin in the editor-in-chief role in January 2020. Appointment is for a term of four years, with an option to renew for a second term. See the complete Thomas Say Publications editor-in-chief position description [PDF] for further detail. two examples that best represent the candidate's published work. The deadline for applications is 5 p.m. Eastern Time on February 25, 2019. For questions about the editor-in-chief position or application process, please contact Lisa Junker, ESA director of publications and communications, at ljunker@entsoc.org. ABOUT: ESA is the largest organization in the world serving the professional and scientific needs of entomologists and people in related disciplines. Founded in 1889, ESA today has more than 7,000 members affiliated with educational institutions, health agencies, private industry, and government. The Society stands ready as a scientific and educational resource for all insect-related topics. For more information, visit www.entsoc.org, and visit www.insectscience.org to view the full portfolio of ESA journals and publications.